sure you’re not dreaming. If the pinch hurts, you’re awake. But for one woman who actually won $8.5 million on a jackpot, pinching herself was just the start of the pain she was about to experience. 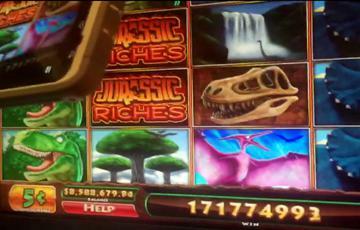 It happened in Washington when a woman from Oregon named Veronica Castillo hit an $8 million payout playing the Jurassic Riches slot machine. She was so excited, she even captured the win on her phone. Naturally, with that kind of win, you’d want to mark the occasion and have something amazing to commemorate and remember the moment. But within seconds of recording, casino security approached and stopped her from recording the machine. She did manage to capture the balance in the lower left corner, which showed a balance well above $8 million. It turns out being asked to stop recording was a prelude of things to come. Castillo was then told that the casino malfunctioned and she would not be paid out her winnings. Not $80 million. Not $8 million. Not even $8,000. But she did manage to score something with an 8 in it. She got $80. Seriously. An $8 million win slaughtered to bits and reshaped as a measly $80 cash prize, barely enough to pay for a hotel room. Naturally, slots players are crying foul but the casino says too bad. So does the casino have too much power? After all, this story seems to pop up in the news on an all-too frequent basis. Well, it turns out casinos might be in the right here. Sort of. The slot machine in question listed a top cash prize way below the $8 million. The slot machine likely did malfunction, and the casino clearly doesn’t have the money to pony up $8 million. Many progressive jackpots come with a top prize of a few million, so it’s understandable that this was likely a malfunction. In many states, the law says that casinos don’t have to pay out machines that malfunction. However, as casino owners, we feel that the $80 top prize awarded is a little insulting. The casino could very well have paid out $800 or even $8,000. It likely takes in that kind of money at the Blackjack tables in a matter of a few minutes. If the casino was really concerned about the bottom line, complimentary dinner vouchers or even a stay at a hotel would have been appreciated. In fact, vouchers of that nature often cost the casino nothing, or at the most pennies on the dollar of the actual cash value. You won’t see malfunctions of that nature at Silver Oak Casino. And if you ever do run into a situation where a slot machine messes up the payout, you can be sure we’ll treat you to a lot more than just a tiny percentage of the actual value. What’s more, we’ll never ask you to stop recording your win on your iPhone. That’s just crazy.